A defining feature of Parkinson's disease is the clumps of alpha-synuclein protein that accumulate in the brain's motor control area, destroying dopamine-producing neurons. Natural processes can't clear these clusters, known as Lewy bodies, and no one has demonstrated how to stop the build up as well as breakdown of the clumps—until perhaps now. 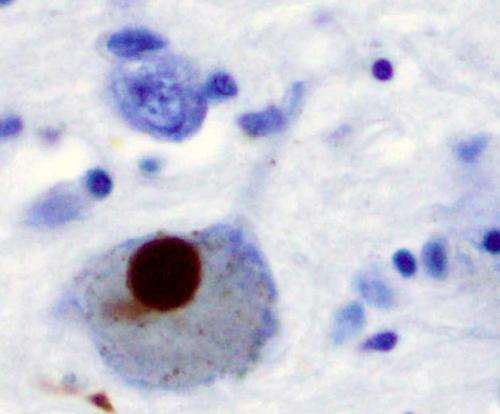 "This study provides novel evidence that USP13 affects development and clearance of Lewy body protein clumps, suggesting that targeting USP13 may be a therapeutic target in Parkinson's disease and other similar forms of neurodegeneration," says the study's lead investigator, Xiaoguang Liu, MD, Ph.D., an assistant professor of neurology. "Overexpression of USP13 in post-mortem brains with Parkinson's disease was never discovered before this work. Its presence indicates that this molecule might reduce parkin's ability to tag proteins with ubiquitin or may strip ubiquitin away from certain molecules like alpha-synuclein, resulting in accumulation of toxic clumps in the brain," said Charbel Moussa, MBBS, Ph.D., the study senior investigator and director of GUMC Translational Neurotherapeutics Program. Excellent work! Not yet a treatment, but highly likely to result in an effective treatment.